A broad range of new equipment. It appeared from busy aisles at this years Focus On Imaging Exhibition that photographic business is actively fighting off the economic depression, possibly even in rude health. With around one hundred and sixty exhibitors there was plenty to see. There was a whole range of new developments as well as the old favourites. 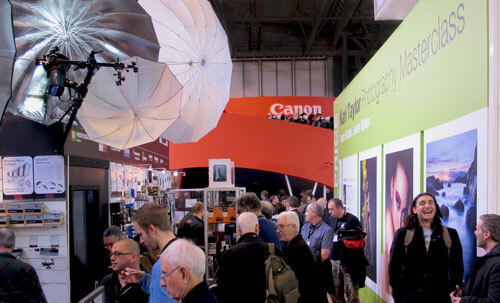 A Key aspect of the show this year was the new ranges of cameras. Leading manufacturers were actively promoting mirrorless cameras. The gradual shift away from the point-and-shoot market also seemed to continue. The camera market appears to be changing. Heavy duty technologies from the top-of-the-range DSLRs are being used in the lower end cameras. The market seems to be shifting in favour of high resolution processing right through the full range. The economic climate is obviously still impacting. A predominant theme on retail stands was deals and offers. There was plenty on offer too. In previous years many of the accessories available in the UK seemed to be expensive compared to current prices. Today imported goods appear to be impacting the market. Exhibitors were showing equipment which appeared robust and very competitively priced. The shift in the camera market also appears to be creating deals. There were very good prices offered on cameras in all segments of the market. Many of these deals reflect depressed prices in the market in general but the many of the stands were offering greater reductions than even shop prices. The show organisers unfortunately failed to publish the event list this year. Show goers were left to pick up what information they could about various talks and demonstrations from stands themselves. It made choosing how to spend our time was a little difficult. However, I managed to see three interesting demonstrations. There was a lot of emphasis on lighting techniques this year. Some very good models and backdrops were shown and lots of people were taking photographs. If you are going to go to the show take your camera for some additional fun. Aside from impressive stands by Canon and Nikon, Sigma had an impressive spread of lenses available. There were some excellent tripods on show this year on several stands. Despite the reluctance of beginners to buy them, the tripod market is both competitive and innovative. Tripod heads are getting smoother and there are some very interesting new ideas, particularly in the high-engineering end of the market. However, the top tripod head units were weighing in at around £500… not a price to be taken lightly. Other stands of interest included the extremely active Disabled Photographers’ Society. That society fosters a wonderful camaraderie and energy among its members. The Royal Photographic Society were also at the exhibition showing continuous short events which were well attended. They also are in active recruiting mode. My overall impression of the exhibition this year was one of great energy. There was a lot of business being transacted and show-goers were being dynamic on all the stands. It was an enjoyable day, and one that will help to keep me informed about products and trends in this business. This entry was posted in Insights, Opinion, Report, Review, Tips Tutorials & Techniques and tagged Camera, Disability, Disability photography, Mirrorless, National Exhibition Centre, NEC, Point-and-shoot, Royal Photographic Society, Tripod, Tripod head, Tripods, Vocabulary. Bookmark the permalink.